One of the most important feature of Oracle RAC is High Availability, more resilients components you have better is your Clusterware HA Score. For Oracle Clusterware the Interconnect Network Plays a big rule in your enviroment, let's supose you lost connection between your private network Oracle will choose some nodes to be evicted. For that reason we should look a little foward on this. 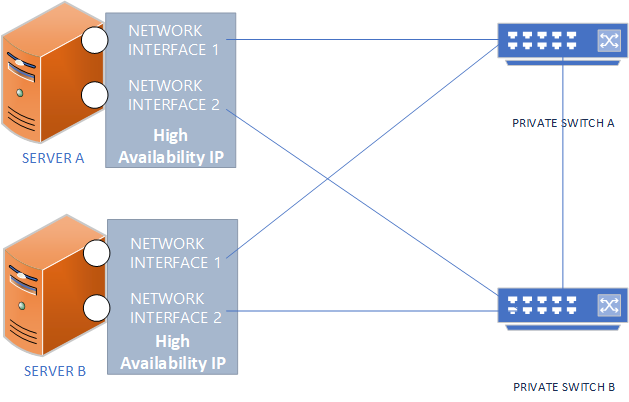 To ensure resilient over network we use Link Aggregation, this could be implement over a variety of hardware components such NICs and Network Switchs. We can use some OS Techinics to implement link aggregation like bounding, and the system administrator is the responsable to garantee resilient over this network. There is no problem on this approach, actually a large number of environment use it, but, Oracle has it's approach too. From Oracle 11.2.0.2 we can use HAIP (High Availability IP) instead the OS method. For this we have to configure a second network card over a different subnet from the first interconnect, that is for garantee HA, keep in mind that you should use the same MTU and have the network interface name over all nodes. You can have up to four active device for HAIP but you can configure more, but Oracle will use only four, in case you lost one Oracle will choose another configured device to replace the lost one. Still in case of a failure of a single device you will not soffer for bounces or disconnects Oracle will available over all nodes. We can use oifcfg getif to verify all network used by Oracle Clusterware, the main ideia is to add the 192.168.2.0 subnet as a second network in a link aggregation. PING srv-ora-rac01-priv2 (192.168.2.74) 56(84) bytes of data. PING srv-ora-rac02-priv2 (192.168.2.75) 56(84) bytes of data. From this we already have Interconnect capable to failover but we need to restart CRS in all nodes to make full use of HAIP. Ok, nothing happen to node, all services remain available as expected.